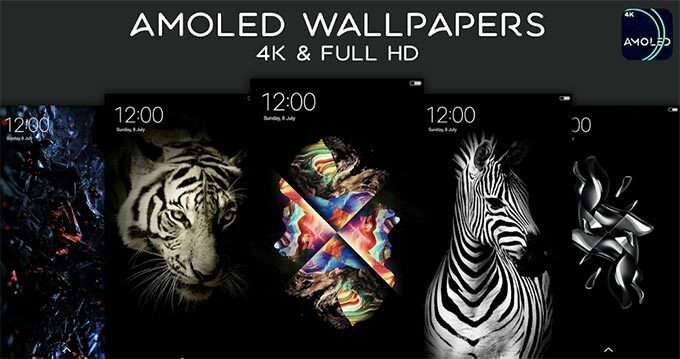 Are you looking for the Free Android Apps for AMOLED Wallpapers (4K)? If yes, then you have landed on the right page pal. This article will walk you through the best Super AMOLED Wallpapers (4K) android apps in the market. So, you must have a smartphone with an AMOLED display, or you might be planning to buy one. But, do you know that you can save smartphone battery life by 30% by using an AMOLED Wallpaper? It’s alright! I was also not aware of the same initially, however, since then I have always used smartphones with super AMOLED displays. Before learning about the AMOLED Wallpaper apps, we must know whats AMOLED display technology is and how it works? This not very technical stuff, and I would recommend you to go through. However, if you don’t want to read about that, you skip this section and jump over to the Super AMOLED Wallpapers (4K) android apps section. What is AMOLED display technology? The term AMOLED stands for Active Matrix Organic Light Emitting Diode. Nowadays, this AMOLED display technology is quite popular and currently being used in Smartphones, Smartwatches, and Laptops. And there is some upgraded version of this technology we can notice in the market called Super AMOLED Displays. According to Wikipedia, AMOLED display technology was used in any smartphone for the first time in the year 2008. Can you take guess, which smartphone was that? I can bet that you or someone is known to you must have used that smartphone in 2008 or 2009. The first commercially successful smartphone with AMOLED display was the Nokia N85, followed by the popular Samsung Galaxy S. And after that the use of AMOLED display in Smartphones getting larger day by day. Furthermore, let’s understand that why the use of AMOLED display is so popular. And why you should use AMOLED Wallpapers on Smartphone with AMOLED display. 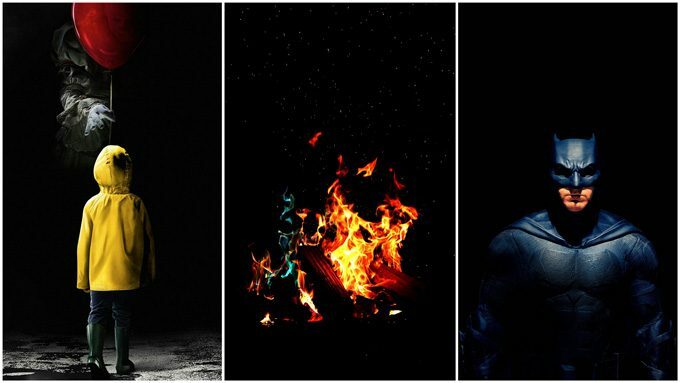 Any guess, why you should use AMOLED Wallpapers on Smartphones with AMOLED display? Frankly speaking, I was curious too to know the benefits of (so-called) AMOLED wallpapers on AMOLED display smartphones. So I researched about it and found that there could be multiple benefits to use AMOLED Wallpapers on Smartphone. And few of the benefits are following. Yes. According to a study, you could save more than 30% battery life on a smartphone if you use dark AMOLED Wallpapers instead of using a bright and white Wallpaper. As the AMOLED displays are very bright by default. You will be able to see the display in very low light or even in full sunlight quite easily, because of the dark AMOLED Wallpaper. You must be thinking why only AMOLED, this characteristic is also applicable to the LCD displays as well? This is because AMOLED displays only light up those LEDs wherever light is required rest area or I would say LEDs of the black areas of the display don’t lighten up. Due to higher refresh rates in comparison to LCD or other displays, the response time of the AMOLED displays reduced by less than a millisecond. As a result, we get a buttery smooth experience and display responsiveness. Further, without any delay. Let’s discuss some of the Best Free Android Apps for AMOLED Wallpapers Download. Here I will discuss the details, available options and features of the Best Free Android Apps for AMOLED Wallpapers Download. However, the given below list of Android Apps is not in any specific order. But for your ease, I have recommended two apps which I use the most. A wide range of AMOLED Wallpapers (Deep/Pure Black). A number of Wallpaper categories and/or tags. The ability of Download and/or Save Wallpapers directly to your USB storage. 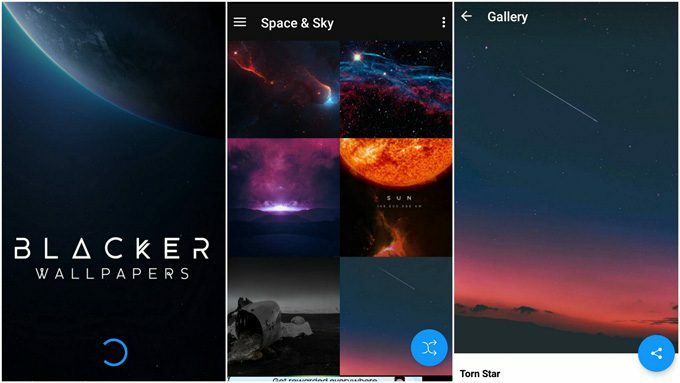 Set Super AMOLED Wallpapers (4K) to your home screen directly from the app. Share Wallpapers with friends from the app itself. All the apps are free to use. And all the stats (no. of downloads and ratings etc.) are of till date. Features and Settings – This Android app offers a simple user interface. It supports devices with all screen resolutions, you can download wallpapers for your desktop as well. You will also be able to add wallpapers to your favorite list. As the app size is quite low i.e. less than 3MB and it doesn’t be a burden for your RAM either. This app contains Ads and I find that the placement of Ads is quite annoying. Google Play Store Rating – Super AMOLED Wallpapers (HD/4K) has an overall Rating of 4.4 out of 5. More than 26,000 users rated this app and out of that, around 18,600 users have given 5 Star Rating. Downloads – The App has been downloaded for more than 1 million times till now from the Play Store. Minimum Android Requirement – You need to have an Android device installed at least Android 4.1 Jelly Bean to run this app. Current Version of this App is v27 and this updated version was released six months back. Permission required – Super AMOLED Wallpapers (HD/4K) Android App will access your Contacts, Storage and Data and WiFi connection details to download wallpapers on your smartphone. You also need to give permissions to access your identity, Photos & Media files. Features and Settings – It offers a wide verity of AMOLED Wallpapers. The UI of this app is based on Google’s Material Design using the dark theme. The app also offers a slideshow option to view Wallpapers. You can also request to the developers for any specific wallpaper. Also, you can submit your own wallpaper(s) directly using the app. The app has updated its features and removed the annoying ads in the newer version. 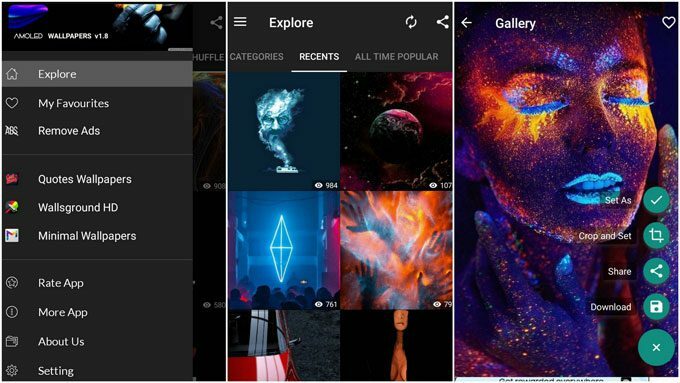 Google Play Store Rating – Blacker: Dark & AMOLED Wallpapers (HD,4K) app rated by more than 16,000 users. The overall rating of this app is 4.6 out of 5 and around 12,000 app users gave 5 Star Rating to this app. 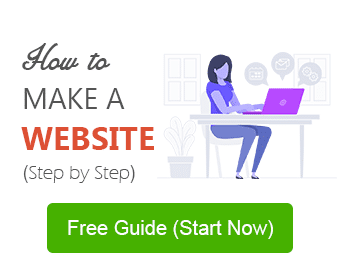 Downloads – It has been downloaded more than 500 thousand times. Minimum Android Requirement – The app is compatible with Android devices which run on Jelly Bean i.e. Android 4.1 or higher. Current Version of this App is v2.1.3 and was last updated in Jan. Permission required – Blacker: Dark & AMOLED Wallpapers (HD,4K) App requires permission to access Storage, Photo/Media/Files and phone’s data connection. Features and Settings – This app offers device specific Wallpapers in various categories. You can create your favorite wallpapers list. The rating option for the Wallpapers is quite unique and you can rate an individual wallpaper. Also, you can explore wallpapers based on the user’s ratings. This app contains annoying ads. Google Play Store Rating – Wallpapers HD, 4K Backgrounds app is quite popular and received the overall rating of 4.7 out of 5. More than 290,000 users rated this app and out of that nearly 244,000 users rated the app with 5 Star Rating. Downloads – It has been downloaded for 10M+ times from the Play Store. Minimum Android Requirement – Wallpapers HD, 4K Backgrounds app runs on the devices with minimum Android 4.4 i.e. KitKat. Current Version of this App is v2.4.26, it was last updated in the month of Oct. Permission required – This app will access your USB Storage and will require full network access to run properly. Features and Settings – AMOLED Wallpapers app let you set your background wallpaper after manual cropping. The app offers a wide range of wallpapers along with Quotes Wallpapers. The shuffle option is quite handy and offers you random wallpapers. You will also able to see the number of views of each wallpaper and based on that they also offer an All Time Popular Category. This app also contains ads with irritating placement. Google Play Store Rating – AMOLED Wallpapers app is relatively new in comparison to others listed apps. Still, the app has managed to get an overall rating of 4.5. Nearly 10,100 users rated this app with 5 Stars out of 15,700 ratings. 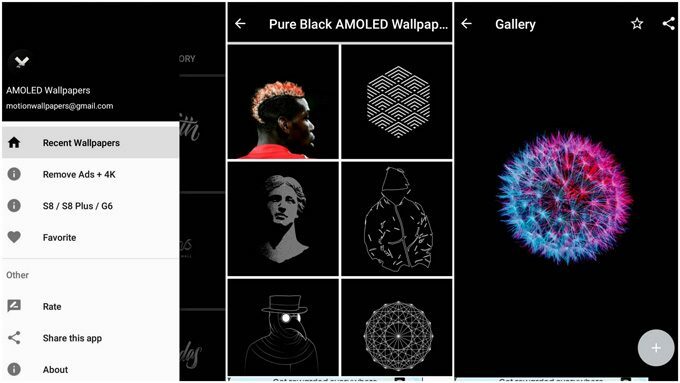 Downloads – AMOLED Wallpapers app uses and downloaded by a half of million users from the Play Store. Minimum Android Requirement – It runs perfectly with Android 4.1 (Jelly Bean) or higher version of Android devices. Current Version of this App is v2.2, last updated was released in Nov. Permission required – Apart from USB Storage and full network access, the app also control phone vibration and prevent the device from sleeping. Features and Settings – This second last app on this list is quite unique. As it offers very useful features. Apart from Recent, Shuffle and favorite list, it also offers details of each wallpaper i.e. size, resolution, no. of downloads, date created etc. I would recommend you this app if you are a person who is easily offended by the annoying ads because this app doesn’t contain Ads. 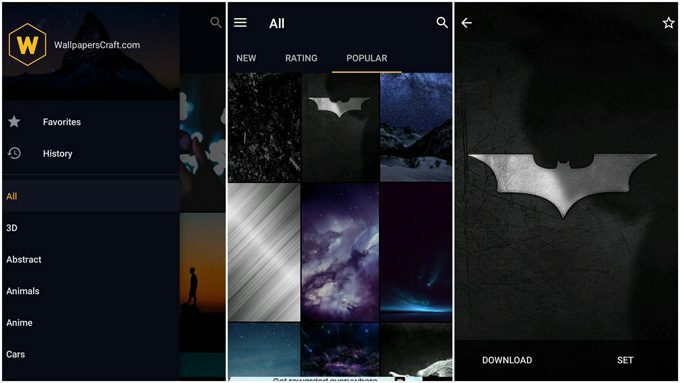 Google Play Store Rating – Darkops: AMOLED Wallpapers app has been rated by more than 14,000 users. The app scores overall rating of 4.5 and nearly 10,600 users rated this app with 5 Stars. Downloads – This app also has been downloaded by 1M+ users from the Play Store. 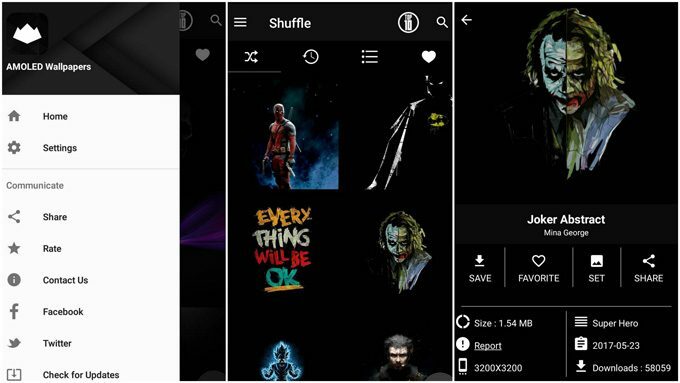 Minimum Android Requirement – Darkops: AMOLED Wallpapers app requires minimum Android 4.1 (Jelly Bean) devices to run. Current Version of this App is v4.3 and last updated in Oct. Permission required – The app will run at startup, it adjusts your wallpaper size, access USB Storage, and data networks. Features and Settings – The latest addition in this list of Super AMOLED Wallpapers app is only for you. The app is listed last on the list, but you know, it is not definitely the least. As this is a new app compared to others, offers quite unique and new wallpapers. It has numerous categories for wallpaper selection and more than 10000+ UHD wallpapers are available for free download. You will also find the save as and set as. type of common features in the app. The app does have ads, however, an ad-free trial plan if available for you. Google Play Store Rating – AMOLED Wallpapers | 4K | Full HD | Backgrounds app has been rated by more than 3600 users. The app scores overall rating of 4.5 and nearly 2,600 users rated this app with 5 Stars. Downloads – This app also has been downloaded by 100K+ users from the Play Store. Minimum Android Requirement – AMOLED Wallpapers | 4K | Full HD | Backgrounds app requires Android 5.0 (Lollipop) devices to run. Current Version of this App is v1.1.2 and was last updated in Nov. Permission required – The app will adjust your wallpaper size, access USB Storage, and data networks and controls vibration. Download App – Here is the Download link AMOLED Wallpapers | 4K | Full HD | Backgrounds app. I have tried all the listed apps to download AMOLED Wallpapers and I find Blacker: Dark & AMOLED Wallpapers (HD,4K) and Darkops: AMOLED Wallpapers quite impressive. Have you tried these apps already? Or might have been using other Free Android Apps for AMOLED Wallpapers. Do let us know your favorite app in the comments section below.